I have a great guest post for you today! When M and I were in Germany we ate quark at the breakfast buffet we enjoyed when we were visiting Mainz. This fresh cheese is really delicious and is way easier to make than I ever realized. If you’ve never made cheese this is a great recipe to start with. Thanks to Cate from International Desserts Blog for contributing this to MarocMama! Have you ever heard of quark? If you haven’t, you’re not alone! I had no idea what it was until I moved to Germany. During that first year abroad I lived with a three German host families (I was an exchange student). The one thing they all had in common? Little tubs of thick and creamy quark in their refrigerators. From the first bite I was in love. I ate quark every chance I got, whether for breakfast, as a snack or in the form of German cheesecake. For years I mistakenly thought quark was a type of yogurt. After all, in German grocery stores it’s sold right next to the yogurt. You’ll also find quark in both plain and fruity flavors, just like yogurt. Many people eat it for breakfast, as a snack or for dessert. But quark isn’t yogurt at all! It’s actually a soft, unaged cheese. And it’s quite healthy – a great high-protein alternative to Greek yogurt. One thing I love about quark is that it’s not tangy or sour like yogurt often is. Quark can be prepared in both sweet and savory ways. 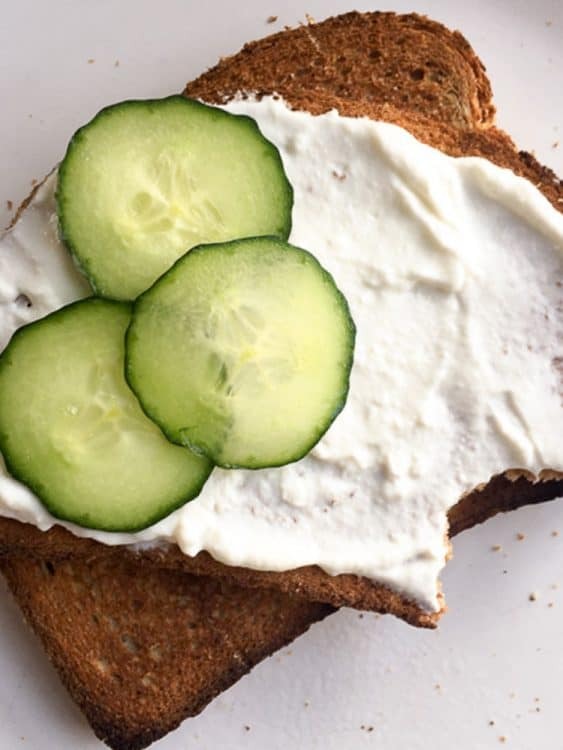 When I crave a savory breakfast, I spread plain quark on a slice of hearty whole-grain bread. When I want a sweet breakfast or a quick snack, I top a bowl of plain quark with fresh berries and a touch of honey. 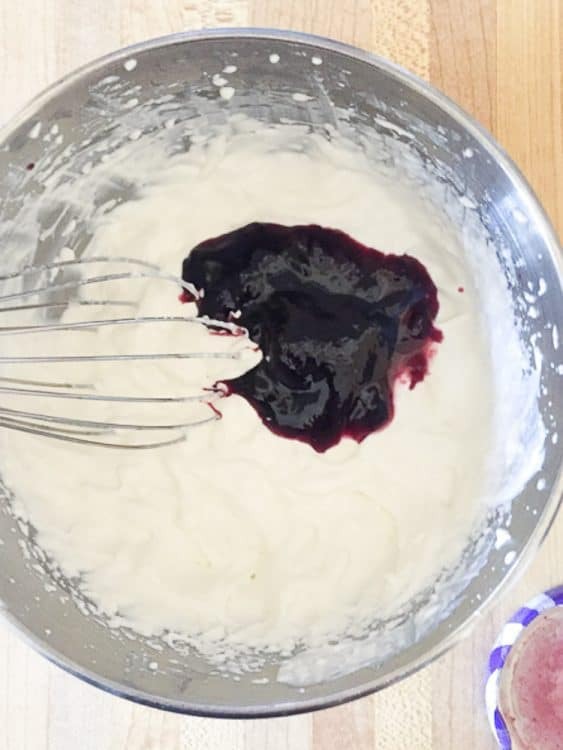 And when I’m looking for a delicious treat, I mix in fresh whipping cream and jam to make a decadent fruit quark dessert (see recipe below). Mmmmmm…no matter how you eat it, quark is delightful. For years I assumed I could only eat quark when I was in Germany. Nobody in the US had ever heard of it! Then, to my surprise, I found some very small, and very pricey, single-serving cups of quark at Whole Foods. I bought one, but was disappointed with the texture and flavor. Once again, I was resigned to only enjoying quark while traveling in Europe — until I discovered just how easy it is to make at home. I wish I’d known this sooner! All you need is milk, buttermilk, and 12-36 hours. It’s so simple and so good. Why not give quark a try! Bring milk to a simmer over low to medium heat. Stir frequently. 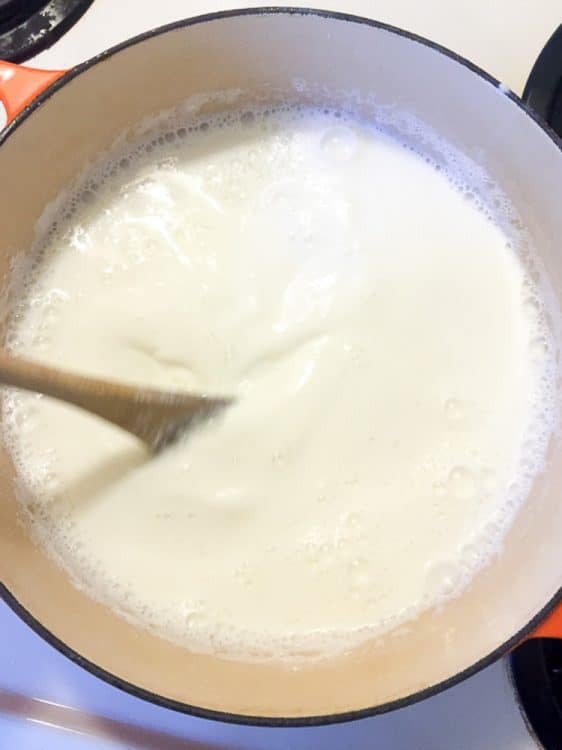 Once the milk has reached a simmer, take the saucepan off the heat and let the milk cool to room temperature. Whisk the buttermilk into the milk. Then pour the mixture into a bowl or a couple jars and cover with a clean tea towel. 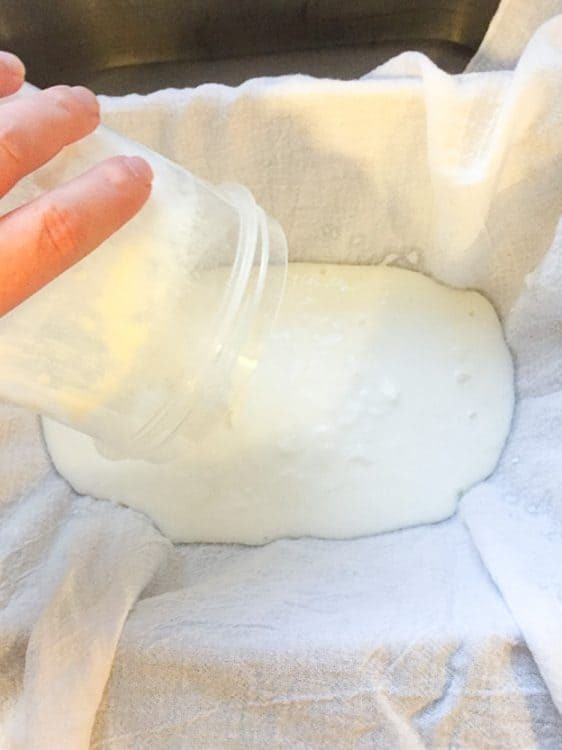 (I’ve used glass bowls, glass jars, and clean plastic yogurt containers and all worked equally well.) Let stand in a warm place for 12-36 hours. On a warm day, it usually only takes about 12 hours for my quark to set. Sometimes, though, it takes as long as 36 hours. If your quark has not thickened after 12 or even 24 hours, don’t worry. Just let it sit out longer. I’ve found it helpful to set the quark on a warm stove after I’ve baked something in the oven. That tends to speed things up, especially on cold days. Once your quark has set, the next step is to drain off the whey and thicken it up. The easiest way to do this is using a large, thin, clean tea towel and a strainer that can sit upright in the sink. First, cover the strainer with the tea towel. Then pour the quark into the strainer. The next step is to hang the quark so more whey will drain off. There are two ways you can do this. The first way is to gather the corners of the towel together and tie the towel to your faucet so the whey will drain into your sink. 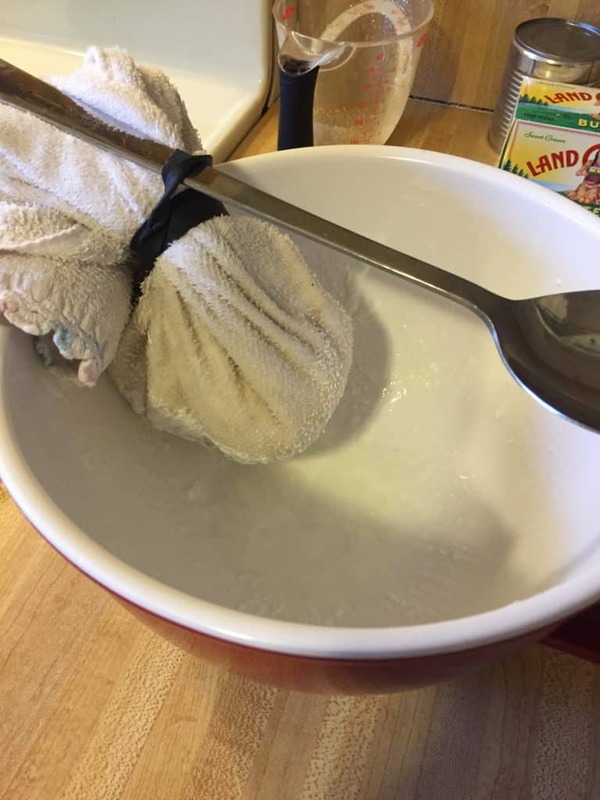 Or you can tie the towel to a long spoon (or use a rubber band to secure the towel to the spoon) and then place the spoon on the edges of a tall bowl. Just make sure there’s enough room for the whey to gather in the bottom of the bowl. If you use the spoon and bowl method, you can let the whey drain off while chilling in the fridge. I let the whey drain off the quark for a couple hours. If your quark ends up thicker than you’d like, just mix a little whey back in. Six cups of milk typically yields 2 cups of quark. You now have plain quark! As I mentioned, I like to spread plain quark on a slice of hearty bread or eat it out of a bowl topped with fresh berries and a touch of honey. When I want something a little more decadent, I make fruit quark dessert. 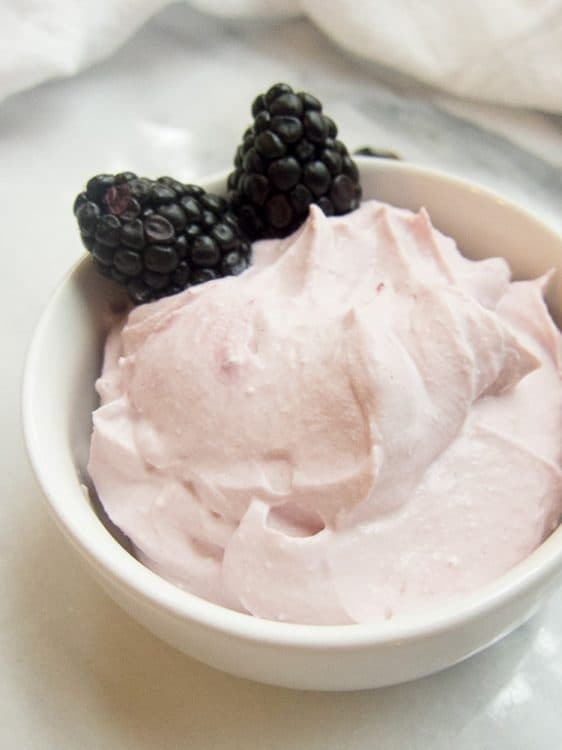 All you need to make fruit quark dessert is fresh whipping cream, jam, and quark. For two portions of fruit quark dessert, whip 1/2 cup plain quark with 1/4 cup whipping cream until thick. For a little extra flavor, add a splash of vanilla extract or a sprinkle of vanilla sugar (link #2). Then mix in 1 tablespoon jam. Top with fresh fruit and enjoy! 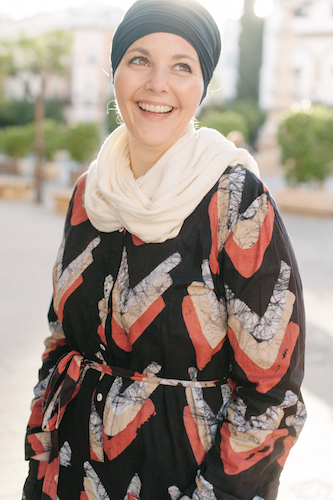 Cate is a former expat turned part-time nomad on a quest to find the best desserts and sweet treats around the world. Join her delicious adventure – and pick up helpful travel tips and delicious recipes along the way – at the International Desserts Blog. I made quark (what I thought was quark) yesterday. 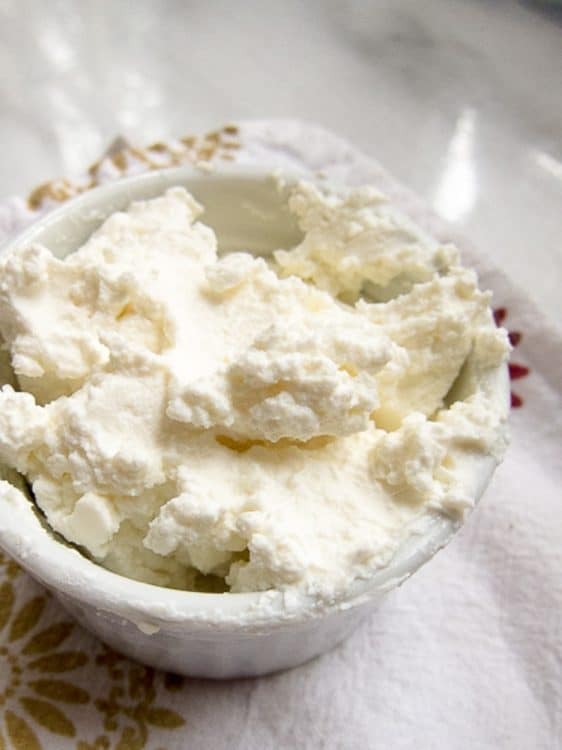 I used low fat cultured buttermilk (Organic Valley) but my quark has the appearance of small curd cottage cheese. I was wanting creamy quark. I wanted it to resemble yogurt not farmers cheese. I only used buttermilk. I heated it until whey & curds separated then drained. Thank you! Hi I’m not sure exactly but my guess is that you used low fat instead of full fat. This can make for a different final product. Sorry I can’t be more help – this was a guest post so I’m not entirely well versed in how to make it! Would skim milk work? I want to try this. I didn’t try it or even notice it when we were in Germany. I actually didn’t know it existed until we got home and I found a recipe for a dessert that called for quark. I researched and found all the details. I’d like to make it. I found some at Wegmans and it was the texture of yogurt, but not as tart or sweet and I loved it. It was not plain, which is really what I wanted. It might but the texture is going to be different. The milk fat in the milk is what makes the texture so if that’s removed the flavor and texture will change. Hi, can I use low fat kefir instead of butter milk? I’ve never tried it. It may work but the texture and consistency is going to be much different.